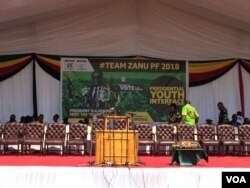 Zanu PF carrying a banner with a picture of President Robert Mugabe. Zimbabwean president Robert Mugabe has threatened to take stern action against people accusing him of allegedly bewitching Vice President Emerson Mnangagwa, who fell sick at a Zanu PF rally in Matabeleland province and had to be airlifted to a hospital in the Midlands. 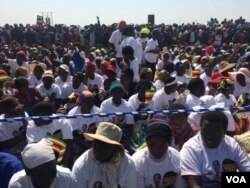 Mr. Mugabe told thousands of people at his party’s Youth League Interface Rally in Gweru, Midlands province, that people accusing him of witchcraft should be taken to court to answer charges of violating some sections of the Witchcraft Suppression Act. President Mugabe appeared to be attacking Mnangagwa’s supporters who want him to succeed the Zimbabwean leader. 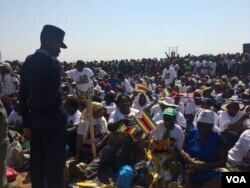 The vice president’s faction of the ruling party known as Team Lacoste claims that Mnangagwa was poisoned before attending the Zanu PF rally in Gwanda. The Zimbabwean president also noted that Mnangagwa’s doctors indicated that his vice president was not poisoned by suspected members of the other faction – Generation 40 said to be led First Lady Grace Mugabe. A security guard towering over Zanu PF supporters in the Midlands. Speaking at the same rally, Mrs. Mugabe said the ruling party is ravaged by factionalism emanating from the Midlands province, which is Mnangagwa’s region. She said some people only like President Mugabe when he is around them and criticize him as soon as he is out of sight. Mrs. Mugabe claimed that her husband was a gift from God and the people of Zimbabwe should be grateful for having such a leader. Zanu PF dumped Joice Mujuru in 2014 accusing her of visiting n’angas in an attempt to unseat President Mugabe. She was also accused of being incompetent and corrupt, an accusation she dismissed as misleading.